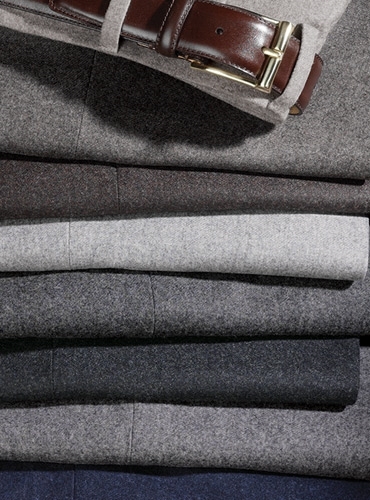 Mélange flannel trousers, in a remarkable and luxurious palette of colors, cut in our Italian workroom from 12 ounce 100% carded wool fabric from Vitale Barberis of Italy. Lined to the knee. Available in either STFF-forward pleat or STFP-plain front. Sizes 32–44 even, and 33–39 odd. Shown from top to bottom: A-light brown; B-medium brown; C-dark brown; D-light grey; E-dark grey; F-charcoal grey; G-medium grey; H-dark blue. 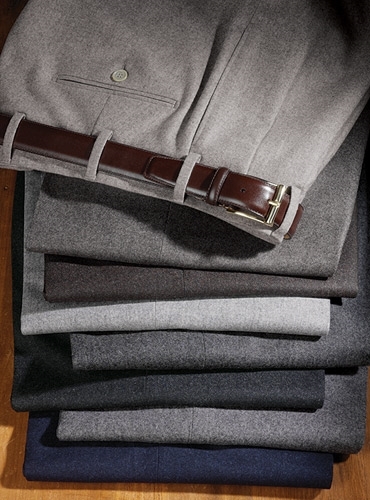 *Short and long rise are standard for our Ben Silver English Drills and Brooklyn Britches Khakis only. Sometimes short and long rises are available for our seasonal selections, please inquire with customer service.